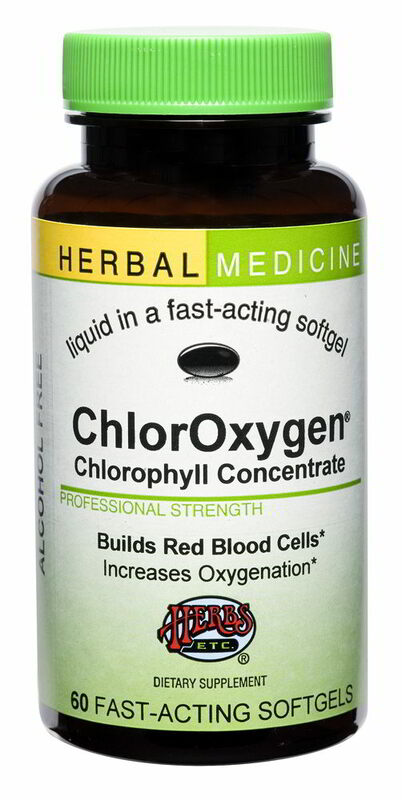 ChlorOxygen Chlorophyll Concentrate (Extracted from English Stinging Nettle) Builds red blood cells. Increases hemoglobin’s capacity to capture oxygen in the lungs and distribute it throughout the body. Helpful in high altitude situations. Supports pregnancy by maintaining healthy hemotocrit levels. Acts as an intestinal deodorizer and offers liver protection. Alcohol free extracts of : Chlorophyll (sodium copper chlorophylins). 50 mg per serving. Sodium: 4 mg per serving. Extra virgin olive oil, beesway. Softgel contains gelatin, vegetable glyceine, carob, chlorophyll.